In 2006 (a phase I clinical trial of TGN1412), a humanized anti-CD28 super-agonist, caused a near-fatal infusion reaction in 6 out of 6 healthy volunteers. The adverse reaction was not predicted by the standard battery of pre-clinical testing, including GLP NHP studies. Subsequent analysis of interspecies differences found that the cells responsible for cytokine storm, CD4+CD45RO+ effector memory T cells, express CD28 in humans but not in the NHP models tests. Subsequent to the clinical trial, it was realized that a better, more clinically relevant method to evaluate cytokine storm risk was urgently needed. It was found that immobilizing TGN1412 on plastic prior to addition to PBMCs could trigger cytokine release by human primary PBMCs. Plastic immobilization presents its own problems, however, and may not be suitable for all the different possible mechanisms of cytokine storm. Recently, a method has been described that allows for the evaluation of soluble, not plastic-immobilized, test articles (Findley et al, 2011). This method allows for dose-response curves to be generated using native-state test article. 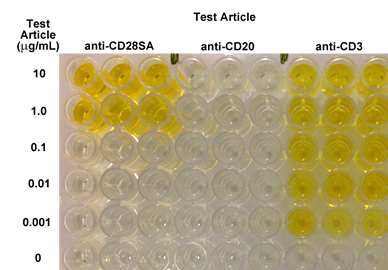 ReachBio Research Labs has further developed this assay to make it suitable for routine use in drug development programs (dos Santos and Clarke, 2014). For more information, please download a copy of the poster describing this co-culture assay system that we presented at the 2014 Society of Toxicology conference. Please CONTACT US to be put in touch with one of our knowledgeable scientists to discuss your project.